Gods are often born on Earth (Bhulok). As you know these incarnations are known as avatars. A popularly known avatars is Shree Krishna. However as per my knowledge, avatars are born as humans (Manava) on Bhulok. Are there any avatars who are not Manavas, e.g. Apsaras, Nagas in other lokas? If not, why don't the gods incarnate as mythical creatures in other lokas? Yes it would seem that the Avatars of the Lord are more numerous on Earth. But that is only because the scriptures that we have talk in more detail about our own Loka or the ones that are relevant to us rather than the others with whom we have no connection. 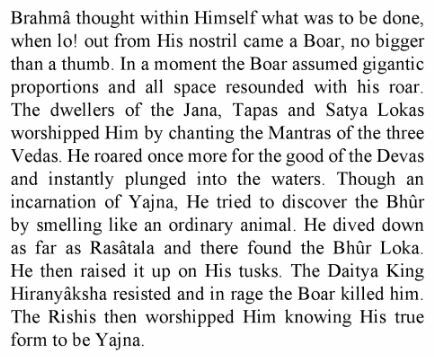 The VARAH incarnation definitely did not happen on Earth but outside it only then the Divine Boar could have lifted the planet Earth on his tusks. The FOUR KUMARS again were not born on Earth rather they emerged from Brahma's min in his own Loka. They frequently travel through different worlds as mentioned in many stories from the Bhagvatam. The horse-headed HAYAGRIVA AVATAR didn't happen on our Loka as its purpose was to return the Vedas that had escaped from Brahma's mouth back to him. Lord took the MOHINI and KURMA forms at the shore of Ksheer Sagar where the Samudra Mantha was taking place. We can see from these examples that the Lord is definitely born in different forms all over his creation wherever he is required & there may be more that are not recorded in our scriptures. Not the answer you're looking for? Browse other questions tagged puranas avatars lokas .